Losing a job might sound terrifying. For those who are in an unemployment period are probably very stressed-- just imagine, one day you still get a job, the next day you lost your job and can’t find a new one. More importantly,there are a lot of expenses every month waiting to be paid. How can you handle all of this? Don’t worry, here we are to dispense some tips for all salarymen who are in a sad mood because of unemployment/ being an unemployed-to-be. Most salarymen might have ever heard about Social Security Fund. Every 5 percent of employees’ contribution have a lot benefits than we’ve ever think especially for those who lost their jobs. 1. A person who has paid contribution for 6 months within 15 months before his/her unemployment with his/her latest employer or insured person in case of force majeure. 2. A termination of employment is at least 8 days. 3. 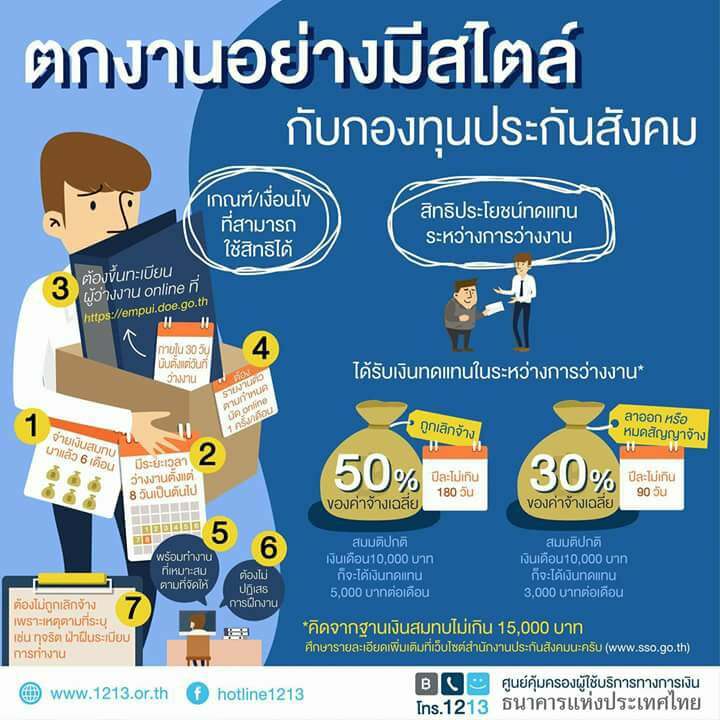 Insured person shall register as job seeker via website https://empui.doe.go.th within 30 days after being unemployed or after an employment contract is terminated shall be entitled to receiving the benefit starting from the 8th day from the date of unemployment with the last employer. 4. A person shall present him/herself on the scheduled time from website https://empui.doe.go.th of Employment Office at least once a month. 5. A person shall be capable of performing the work and is ready to take on suitable job as offered. 6. A person shall not reject the job training. - Having been sentenced to imprisonment by Court judgment. If you are an insured person and have the aforementioned qualification shall be entitled for unemployment benefits from Social Security every month. If you are in the unemployment period, these benefits can partly help you with your expenses. If you have any queries about the benefits, please visit the following website: www.sso.go.th or dial hotline 1506. Older PostHow to collect a debt legally? Here are some helpful hints!